How do crows stay warm in the winter? 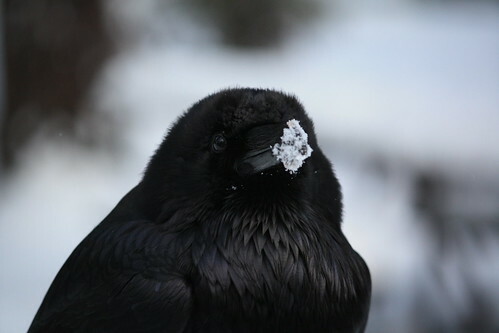 Posted on March 1, 2011 by Corvid Gyrl17 Comments on How do crows stay warm in the winter? Snow ‘stache, originally uploaded by zpeedyz. How DO crows (and other birds) stay warm in the winter? Crows have a higher body temperature than humans due to their significantly higher metabolism. While the average human’s body temperature is 98.6ºF (37ºC), the average bird’s body temperature is appriximately 105ºF (40ºC). To maintain this higher temperature birds have a few physical helpers as well as some behavioral helpers. Birds have unique scales that cover their feet and legs which minimize heat loss. Birds have feathers coated in oil which is important for waterpoofing / snowproofing. Birds often grow more feathers during late fall to give them extra protection for winter. They can also fluff up their feathers during particularly colder days and nights which can reduce the amount of heat loss by up to 30%!!! Birds have a different kind of fat than humans. Birds have white fat which is a high-energy fuel used to power the birds warming process, shivering. Shivering produces heat five times their normal basal rate and can maintain a normal body temperature for six to eigh hours at temperatures minus 70ºF. ((http://www.stantekiela.com/articles.php?articleID=129)) Since this fat is so important to our feathered friends, birds will often try to store extra fat for winter. Crows often go into a state called torpor where they lie on the ground with their bills half-open when sunning themselves, looking to all the world as if they are about to succumb to some terrible malady. ((Lyanda Lynn Haupt, Crow Planet: Essential Wisdom from the Urban Wilderness)) Torpor is a state of unconsciousness where the bird is inactive and their core temperature drops approximately 10-12 degrees, respiration and heart rate drop and the bird’s body then needs less energy, thus saving approximately 20% of the energy which is then used to maintain body temperature. Tucking: When birds stand on one leg or crouch down covering their legs with its feathers. Birds can also tuck their bills into their shoulders as well. Roosting: Crows roost, as many birds do, gathering in large flocks at night and crowd together in a small, tight space so they can share body heat. You can often see thousands of crows roosting together, and boy what a site that is for crow lovers! Want to help keep crows warm in the winter? Put out winter bird foods such as suet, the bird peanut butter, seeds and other bird foods high in fat. Keep your feeders full, check daily. Put out fresh water daily. This will save them the energy of trying to find water. Build or buy crow birdhouses and roost boxes. As you know, if you’ve read the other posts, we feed the crows peanuts daily. This week has been snowy. Today, we got some excellent photographs of the crows. I thought I’d share them with you.